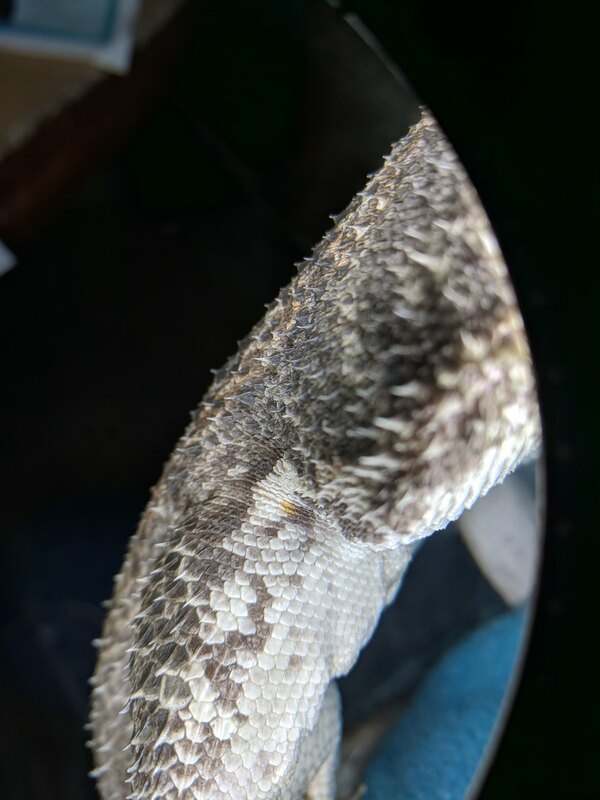 Just noticed this on my 9ish year old boy today where his leg meets his body He has a 60 gallon tank, Mercury vaper bulb, hot spot around 100 degrees Fahrenheit, eats dusted super worms and I've given up on salads. He ate 10 worms today for the first time in two weeks but random hunger strikes are not abnormal with him. He also gets very wobbly and unbalanced sometimes lately whenever he's out. Noticed it for the first time last summer. I've taken him to the exotics vet for both issues and they haven't found a cause. He is the most chill guy ever and snoozes on me for hours. I tried scraping the spot a bit with my nail and rubbing it with a wet q-tip but it didn't come off. The vet opens at 10am tomorrow and I can be waiting at the door but I've taken him four or five times for things that turned out to be nothing or to resolve themselves so I want to make sure it's an actual possibility before I go. Thanks in advance for any help! Check out Clovis, my cuddly girl who loves to visit my students! I'm gonna say no, but admittedly I don't have much experience with yellow fungus so i'll let someone who does chime in and confirm or deny that. In regards to the shaking and wobbling, not really a good sign. Which MVB are you using? And how far is it from where your dragon basks? You should still try to offer a salad every day, even if he doesn't seem interested. Lots of good nutrients he's missing out on by not eating his salads. At 9 years he is getting up their in age, but it's not really "old" as far as dragons go. No Y. F. there, just a random speck of orange pigment. claudiusx wrote: I'm gonna say no, but admittedly I don't have much experience with yellow fungus so i'll let someone who does chime in and confirm or deny that. Thanks, I will! I just got fed up because he never touched them. Mercury vaper has mvb, so it's basking and heat in one. It's closer than 12 inches. Last year they did blood work when the wobbling started and his calcium levels were fine. I'll ask about it again. And thanks for saying it's not YF! 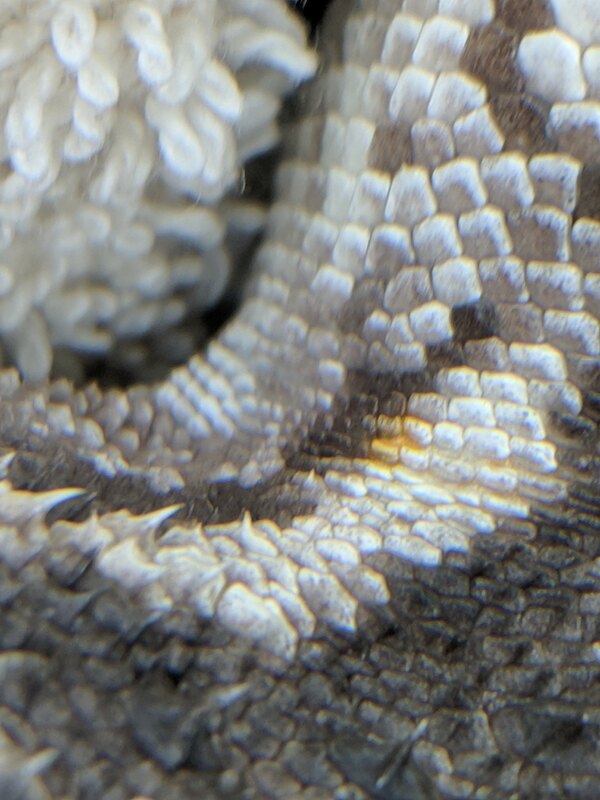 It doesn't look like the pictures but it's crusty under his scales there so I'm worried. AHBD wrote: No Y. F. there, just a random speck of orange pigment. It's new though, and kind of crusty under the scales. :/ It's small right now and I don't have a macro lens so it's hard to see the details. It doesn't look like the pictures I can find of yellow fungus but I'm scared. I'm going to soak him tomorrow and see if it comes off. I know MVB provides UVA and UVB but I was asking which MVB you are using.. such as megaray, powersun, etc.? MVB's just like all bulbs that produce UVB start degrading with time, which is why I asked how old it is. Sorry Brandon! It's an Exo-Terra. I just changed it out a month or two ago. I try to change them every year. I got a better magnifed picture this morning. Update: The vet said she can't tell what she is looking at from the picture but to confirm YF they'd have to take a tissue sample. As you can see from the first picture, it's a tiny little spot right where his leg meets his body. I don't want him to have a wound that limits his movement just to ease my mind so I think I'm going to just watch it very carefully for now and bring him in if it spreads at all. Am I doing the right thing? Yes, you can go ahead & wait by just watching the area to be sure it doesn't spread.